Antoine-François Marmontel: (b Clermont-Ferrand, 16 July 1816; d Paris, 16 Jan 1898). French pianist and teacher. He was a pupil of Zimmermann at the Paris Conservatoire where he won the premier prix in 1832, playing a concerto by Alkan. He then studied composition with Le Sueur and in 1835 won a deuxième prix in counterpoint and fugue with Halévy. He taught solfège at the Conservatoire from 1837 and piano as a temporary replacement for Herz in 1846. In 1848 he succeeded Zimmermann, and he retained this class until his retirement in 1887. His reputation as a teacher was outstanding; his pupils included Albéniz, Debussy, d’Indy, Diémer, MacDowell, Pierné and Planté. He also taught his son Antonin-Emile-Louis Corbaz (b Paris, 24 Nov 1850; d Paris, 23 July 1907), who won the premier prix in piano at the Conservatoire in 1867 and taught piano there from 1901 until his death. Marmontel’s many piano studies and other piano solo pieces including sonatas number about 200. He also edited more than 300 piano works for Heugel’s series ‘Ecole classique du piano’. Ernest Guiraud: (b New Orleans, 23 June 1837; d Paris, 6 May 1892). French composer. He was the son of the composer Jean-Baptiste-Louis Guiraud (1803–c1864), a pupil of Le Sueur and Reicha who won the Prix de Rome in 1827 in competition with Berlioz and later emigrated to New Orleans. Ernest went to Paris at the age of 12; in April 1853 his opera David, on a libretto set by Mermet in 1846, was played in New Orleans, but in 1854 he was back in Paris, assisting Berlioz with the performance of L’enfance du Christ. He studied at the Paris Conservatoire with Marmontel and Halévy and was a classmate of Bizet. His op.1 is a virtuoso piano sonata composed at this time. He won a premier prix for piano in 1858 and the Prix de Rome for composition (Bajazet et le joueur de flûte) in 1859. In Rome he renewed his friendship with Bizet, the laureate of two years earlier, and they remained close friends until Bizet’s death. On a journey together through Italy in 1860 Bizet described Guiraud as ‘so nice, so friendly; in his approach to life, to playing and to music he is a little soft, a little apathetic. I am trying to liven him up a bit’. Guiraud is now best known for the recitatives he added to Carmen for the Vienna production of 1875 and for his arrangement of the second suite from L’arlésienne. But he composed a great deal himself, mainly for the stage. Most of his operas are in lighter forms, not exceptionally brilliant or successful, though well appreciated in their time. The one exception is Frédégonde, a grander, more ambitious work on a fashionably legendary subject, and in a markedly more modern style, left unfinished at his death. It was completed by Saint-Saëns and orchestrated by Dukas, but was not well received in 1895. A more distinctive style is to be seen in his orchestral music, especially the Ouverture d’Arteveld and the two suites, all worthy contributions to the revival of French orchestral music after 1870. The symphonic poem Chasse fantastique (1887) also deserves to be heard. Guiraud’s fame rests on his contacts with other composers. Apart from Bizet these include Offenbach (whose Contes d’Hoffmann he orchestrated), Debussy and Dukas (both of whom studied composition with him). He was professor of harmony and accompaniment at the Conservatoire from 1876 and of composition from 1880 until his death. He liked Debussy, but was barely able to grasp his brilliant pupil’s new ideas of harmony and colour. Just before his death he published a Traité pratique de l’instrumentation (Paris, 1892). August Durand: (b Paris, 10 July 1830; d Paris, 31 May 1909), he was a classmate of Franck and Saint-Saëns at the Paris Conservatoire, studied the organ under Benoît and was organist at St Ambroise, Ste Geneviève, St Roch and St Vincent-de-Paul. He was also a music critic; his compositions include sacred and secular vocal music and many works for the piano and organ. He also composed, arranged and published extensively for the harmonium. Cyril Scott: (b Oxton, Cheshire, 27 Sept 1879; d Eastbourne, 31 Dec 1970). English composer, writer and pianist. He showed early musical talent and at the age of 12 was sent to the Hoch Conservatory, Frankfurt, to study under Lazzaro Uzielli and Humperdinck. He returned to England 18 months later and continued his studies under Steudner-Welsing in Liverpool. A second period of study at Frankfurt began in 1895, this time under Iwan Knorr. Fellow composition students included Grainger, Norman O’Neill, Roger Quilter and Balfour Gardiner, who, together with Scott, were soon to be referred to as the ‘Frankfurt Group’. It was during this period that he formed a close friendship with the poet Stefan George, whose work he later translated. Scott left Frankfurt in 1898, returning to Liverpool and teaching. In 1900 his Heroic Suite was performed in Manchester and Liverpool by Richter, and his First Symphony in Darmstadt under Willem de Haan. Although well received at the time, both works, together with much of the chamber music he had written during this period, were later withdrawn. Scott’s London début came in 1901 with a performance of the Piano Quartet in E minor. His Second Symphony (later reworked as Three Symphonic Dances) was conducted by Wood at a Promenade Concert in 1903. He signed a contract with Elkin for songs and piano pieces, and in 1909 a similar agreement was made with Schott for large-scale works. Many of the original manuscripts of works published in Germany were destroyed during World War II. The long series of Impressionist piano pieces and songs that followed the Elkin agreement, together with frequent recitals and his own strikingly romantic appearance, established his reputation as a ‘modernist’ composer. His most outstanding achievement in the pre-war period was the Piano Concerto which Beecham introduced at the British Music Festival of 1915. In 1921 Scott married the novelist Rose Allatini. By this time he had begun to take a serious interest in Indian philosophy, which led to his becoming a Vedantist and finally a follower of the Higher Occultism. He also became absorbed in the study of naturopathy, osteopathy and homeopathy. He was to write successfully and frequently on all these topics, his work being translated into many languages. His literary output included several volumes of poetry (much influenced by Swinburne and Dowson), a large number of unpublished plays, and an entertaining autobiography, My Years of Indiscretion (1924). Between the wars Scott’s music was much performed on the Continent, and a highpoint in his career came with the production of his one-act opera The Alchemist at Essen in 1925 under Felix Wolfe. In England, large-scale works for chorus and orchestra were heard at the 1936 Norwich Festival (Let us Now Praise Famous Men) and the 1937 Leeds Festival (La belle dame sans merci). But by now his music had begun to lose something of its appeal as a novelty. The rich harmonies, languorous melodic lines and rhapsodic diffuseness of form that had once seemed daring and very un-English, came to be regarded simply as part of a period tendency which had seen its most successful expression in the music variously of Debussy and Skryabin. Though still in demand as an interpreter of his own music (he made recital tours all over the world), his reputation as a significant composer went into partial decline. By 1944 Scott had decided to abandon composition, but according to his own account (1969), a ‘significant occult sign’ led him to continue. The fruits of this renewed activity included the opera Maureen O’Mara (1946), an oratorio Hymn of Unity (1947), and a considerable quantity of orchestral and chamber music. In 1962 a group of friends and admirers formed the Cyril Scott Society with the object of arousing interest in his work, but their efforts did not lead to any large-scale revival. A performance of a piano concerto in 1969, however, revealed a work that for all its rhapsodic opulence was stronger than had been suspected, and the Hourglass Suite made a similarly favourable impression in 1971. These performances and a 1993 recording of five major orchestral works suggest that a thorough-going examination of his life’s work is long overdue. In the meantime his reputation is kept alive in England by a handful of songs and piano pieces, though abroad his chamber music still commands respect. The importance of his achievement was acknowledged, during his lifetime, by the International Academy (MusD, FIA 1956), the American Conservatory in Chicago (DMus 1959) and the RAM (1969). Emmanuel Chabrier: (b Ambert, Puy-de-Dôme, 18 Jan 1841; d Paris, 13 Sept 1894). French composer. Best known today for the orchestral showpiece España, Chabrier principally wrote songs, piano pieces and stage works. Though he composed a relatively small body of work, it was of consistently high quality and very influential on French composers in the first quarter of the 20th century. Erik Satie: (b Honfleur, 17 May 1866; d Paris, 1 July 1925). French composer. He was an iconoclast, a man of ideas who looked constantly towards the future. 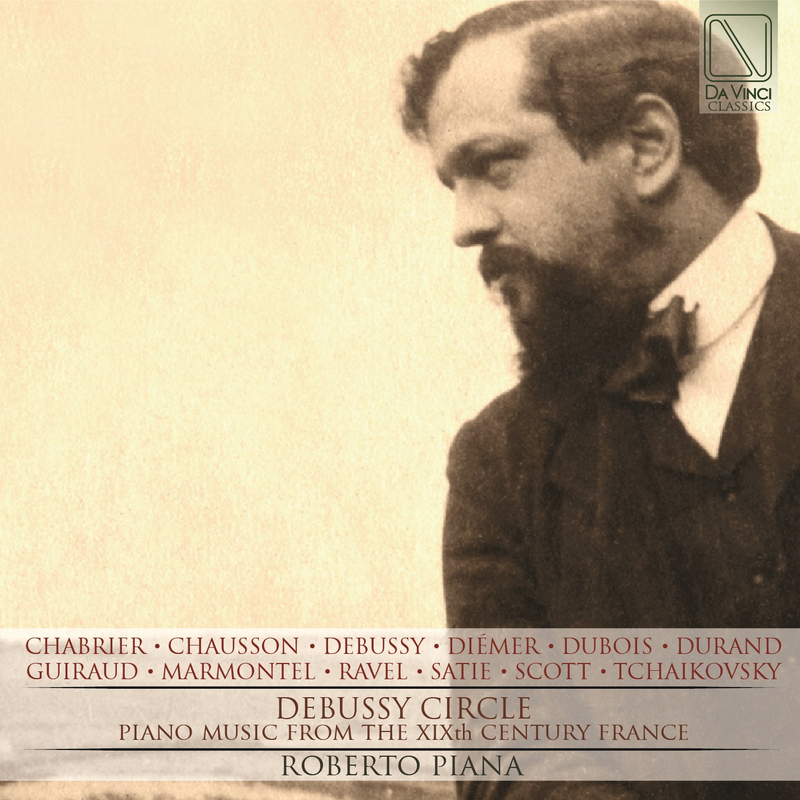 Debussy christened him ‘the precursor’ because of his early harmonic innovations, though he surpassed his friend’s conception of him by anticipating most of the ‘advances’ of 20th-century music – from organized total chromaticism to minimalism. To some extent he made a virtue of his technical limitations, but his painstaking quest for perfection in simplicity, coupled with his ironic wit and his shrewd awareness of developments in other fields of contemporary art, made him the personification of the wartime esprit nouveau in France. Ernest Chausson: (b Paris, 20 Jan 1855; d Limay, nr Mantes, Yvelines, 10 June 1899). French composer. Luis Diémer: (b Paris, 14 Feb 1843; d Paris, 21 Dec 1919). French pianist and composer of Alsatian origin. In 1853 he entered the Paris Conservatoire where he enjoyed a particularly successful career, winning premiers prix in solfège (1855), piano (by unanimous decision, 1856), harmony and accompaniment (1859) and counterpoint and fugue (1861), as well as a second prix in organ (1861); his teachers included A.F. Marmontel (piano), Ambroise Thomas (composition) and François Benoist (organ). Financial difficulties prevented him from pursuing the Prix de Rome. From 1861 he gave piano lessons, and from 1863 performed regularly, both in Paris and in the provinces. He attended Rossini’s soirées, played in the chamber concerts organized by Alard, and toured with Sarasate. Always popular with the public, he steadily gained a reputation as a virtuoso. In 1887 he succeeded Marmontel at the Conservatoire, where he exercised great influence on the next generation of French pianists; his pupils included Cortot, Risler and Robert Casadesus. The success of a series of harpsichord recitals which Diémer gave at the 1889 Exposition Universelle led to the founding (with van Waefelghem, Grillet and Delsart) of the Société des Instruments Anciens, and prompted him to dedicate considerable time to promoting early music. In 1902 he established a trust fund for a triennial competition, with a prize of 4000 francs, open to male pianists who had won a premier prix for piano in the preceding ten years. Diémer continued to teach and perform publicly until his death. He was named a Chevalier de la Légion d’Honneur in 1889. Diémer’s virtuoso playing had a reputation for extreme precision and purity, qualities that may be heard in his recording (c1904) of his Grande valse de concert op.37. A more complete sense of his musicianship may be perceived in his long-lined and tonally refined recording (c1904) of Chopin’s Nocturne op.27 no.2. His compositions, primarily for the piano, were described by Fétis as graceful but not lacking in solidity; some of his songs enjoyed considerable success. He also edited piano music, transcribed symphonic movements and opera excerpts for the piano, and published a piano method. Théodore Dubois: (b Rosnay, Marne, 24 Aug 1837; d Paris, 11 June 1924). French composer, organist and teacher. He was born into a modest, non-musical family in a village near Reims. His father was a basket maker, his grandfather a primary school teacher. When he made rapid progress in his piano studies with Louis Fanart, choirmaster of Reims Cathedral, the mayor of Rosnay, the Vicomte Eugène de Breuil, introduced him to professors at the Paris Conservatoire and provided lodging when he was accepted there in 1854. Studying the piano with Marmontel, the organ with Benoist, harmony with Bazin, and fugue and counterpoint with Ambroise Thomas, Dubois earned a series of prizes in harmony (1856), fugue (1857) and the organ (1859) before winning the Prix de Rome in composition in 1861. At the Villa Medici in Rome he became enamoured of Palestrina’s music and began friendships with his future colleagues, Paladilhe, Guiraud, Bourgault-Ducoudray and Massenet. While at the Conservatoire, he played the organ at St Louis-des-Invalides from 1855, and after 1858 at Ste Clotilde (under César Franck); he was choirmaster there from 1863 to 1869 and at the Société des Concerts in the early 1870s. He then moved to the Madeleine, and replaced Saint-Saëns as organist in 1877. He also taught at the Conservatoire, starting with harmony (1871–91), then composition (1891–6), then serving as inspector of musical education (1884–96) and finally as director of the Conservatoire (1896–1905). Believing that students should have a solid understanding of theory before studying modern masters, he published a number of theoretical treatises. Praised for their clarity and precision and translated into other languages, some are still used today. His other writings include Notice sur Charles Gounod (Paris, 1894) and ‘L’enseignement musical’ (EMDC, II/vi, 1931, pp.3437–71). Musically, Dubois is perhaps best known for his religious works, some of which have remained in the repertory of French churches for decades. The oratorio Les sept paroles du Christ (1867), for example, was performed by the Société des Concerts twice in 1872 and continued to be used at Good Friday concerts until well into the 20th century. Ernest Reyer, who attended its première at Ste Clotilde, said the score was ‘as important as a comic opera, its style resembling 16th-century Italian music given new life with modern harmonies and varied rhythms’. Le paradis perdu won the City of Paris Prize and was performed twice at the Concerts Colonne in 1878. The intervallic writing and phrasing in his sacred works make it easy music to sing, while the skilful use of vocal groups produces a grand effect. Despite the banality of certain repetitions in its Gloria, the Messe brève in E for three voices was reputedly sung ‘almost everywhere’, while the Messe solennelle de Saint-Rémi and the Messe de la Délivrance (which cites Parsifal in its Sanctus) were enjoyed for their dramatic, grandiose effects. Throughout his life, Dubois also wrote secular works for chorus, especially for unaccompanied male chorus. Except for a patriotic sonnet, France (1916), his choral scenes are generally on themes of nature. Although Dubois’ dramatic works are less well known today, many were published by the prestigious house of Heugel. For the most part, they present simple, idealistic love stories in rustic, picturesque settings, perhaps reflecting Dubois’ own background (many were written in Rosnay, where he returned to compose each summer). Despite their banal subjects, two modest one-act comic operas, La Guzla de l’émir (1873) and Le pain bis (1879), were praised for ‘having all that it takes to succeed’. The première of his three-act ballet, La farandole, commissioned by the Opéra in 1882 and set in Provence, was reputedly the first occasion during which electricity was used extensively at the Opéra. Here and in his two subsequent operas, Aben-Hamet (1884) and the popular Xavière (composed between 1886 and 1894), light, graceful melodies and poetic fantasy abound, in marked contrast with the austerity of his sacred music. In one section of Xavière the priest recounts the legend of St Francis and the birds; in another, Dubois incorporates indigenous French folksongs provided by Vincent d’Indy. While using short, periodic, melodic structures inspired by Gounod, these works also make reference to Wagner, whose music Dubois had heard in Bayreuth. The third act of Aben-Hamet incorporates melodic and harmonic aspects of the Tristan Prelude, while Xavière employs leitmotifs and continuous dialogue with symphonic accompaniment. The grand opéra Circé (1896) never reached the stage, although it reflected the national obsession with exotic enchantresses who use their beauty to liberate their countries from oppressive invaders. Dubois’ interest in instrumental music grew after he helped to found the Société Nationale in 1871. The overture Frithiof, first performed by the Société Nationale in 1880, entered the repertory of all the principal French orchestras of the time. His oeuvre includes more than 200 chamber works of uneven quality, as well as several sets of songs and piano pieces. Dubois was a man of discipline and integrity, well liked by his peers. His music was admired for its French character and solid construction, elegance and charm, and purity of style and sentiment. Although he resisted becoming too much involved in the most important musical debates of the time, the clarity and idealism of his music were enough to win him the seat vacated by Gounod in 1894 at the Académie des Beaux-Arts. Piana, Roberto (Pianist) was born in Sassari, on the Italian island of Sardinia, in 1971. He composed his first works in 1985 and began performing in 1990. He perfected his studies with numerous famous pianists, but he owes his training to Isabella Lo Porto, with whom he graduated in piano studies with top marks, at the Music Conservatory of Sassari. Roberto Piana is a multi-faceted artist, engaged over the years in the roles of pianist, composer, essayist, and researcher. As a pianist, he has performed with great success in numerous theatres such as Rond Point on the Champs-Elysées in Paris, Teatro alla Scala in Milan, Teatro Regio in Turin, Scriabin Museum in Moscow, Spazio Oberdan in Milan, Sala dei Giganti in Padua, University of Stuttgart, Germany, and Saint Petersburg, Russia, as well as in cities such as Barcelona, Zurich, Liège, Brussels, Charleroi, Mons, Lausanne, and Düsseldorf. While maintaining a busy performance schedule, Roberto is also committed to the study of lesser-known composers, such as Ansorge, Gutmann, Ornstein, Pomè, Rebello, Tellefsen, Wolff, and many others. However, it is the Sardinian composer Lao Silesu (1883-1953) to whom he has dedicated particular attention. Since 1994, he has authored essays, books, and CDs (Stradivarius, Inedita Edizioni, Documenta Edizioni, Magnum Edizioni, etc. ), and participated in numerous concerts and conferences. His extensive and in-depth studies have led him to the recovery of manuscripts and precious documents. His studies on Silesu culminated in the first-ever recording of this composer’s music, and digital publication of his piano works for the Library of Sardinia. As a composer, Roberto Piana is active from the early nineties. He is a composer of music for piano, vocal, chamber and symphonic music performed in Italy and abroad (Newport Festival in California, Festival Chopin in Duszniki Zdroj, International Russian Music Piano Competition – San José, China, England, Japan, South Africa, Russia, etc.). Some compositions were included into cd (Centaur, Music & Arts, Steinway & Sons, TwoPianists, Editorial Documenta). His Piano Sonata and 25 Preludi pittorici were recently published by Centaur and interpreted by the pianist Antonio Pompa-Baldi. He is the winner of several piano performances and composition contests (Borgo Cortello – Udine, International Competition, Silenzio Musica, Concorso Nestore Baronchelli, IX Concorso Nazionale di Composizione Corale “Nella Città dei Gremi” and others). In 2008, he won the first prize in the prestigious International Competition “Libertango”, dedicated to Astor Piazzolla, and followed that win with the publication of a CD: Astor Piazzolla, Piano Works (Editoriale Documenta). He holds piano master classes in Italy and Russia.